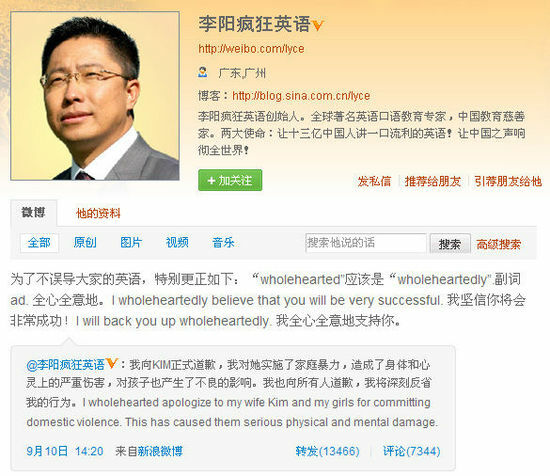 "Crazy English" founder Li Yang yesterday admitted for the first time that he beat his wife and apologized to her and his three young daughters for "committing domestic violence." "I wholeheartedly apologize to my wife Kim and my girls for committing domestic violence. This has caused them serious physical and mental damage," Li wrote on his microblog yesterday. He said he and his wife Kim Lee, a US citizen, are receiving counseling from a psychiatrist. The English teacher famous for his creative language teaching methods also apologized to the public, saying "Sorry to let you down." His latest statement attracted more than 2,500 comments from people following the incident. His wife went online last week to complain about the domestic violence. She also uploaded photographs showing bruises on her head and knees. Early this week, Li had apologized to his daughters for "bringing them into the world without their permission" and "making a great number of mistakes while raising them." However, he did not directly respond to the wife beating claims until yesterday.